During the summer, this very detailed painting of the Battle of Bannockburn by Andrew Hillhouse is on display in the Stirling Smith Art Gallery’s Bannockburn exhibition. 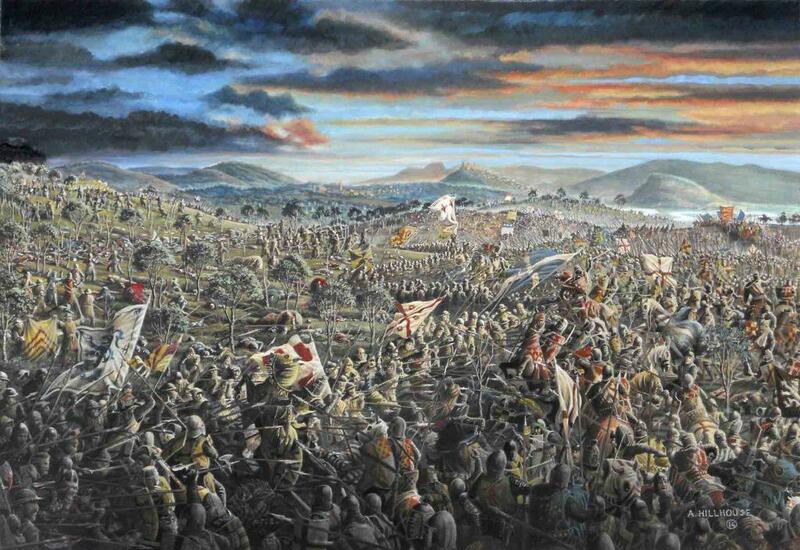 In it, the artist has attempted to include all of the action of the second day of the battle, 24 June 1314. The information is taken from contemporary sources, and the artist has depicted the whole known sequence, from the Scots kneeling in prayer before the battle on the far left, to King Edward fleeing the field on the far right. The painting requires close personal study as it has a key, showing 46 different points of interest, including episodes in the battle, the landscape, and the heraldry of both the Scottish and English knights. There are many ways of understanding the past, and we need to use all of them. Yesterday and on Monday, 700 years to the day and hour, Stirling’s bairns re-enacted many of these episodes, scripted by David Smith, Education Officer at the Smith, and guided by Stirling Council’s Archaeologists Murray Cook and Fiona Watson. On Sunday, the March of the Gillies took place in defence of Gillies Hill, preceded by the annual Bannockburn Rally organised from Glasgow on Saturday. With Bannockburn Live still to come, there are many opportunities to get involved. The Smith’s Bannockburn exhibition runs until October.